The River Breamish rises on the remote southern slopes of Northumberland`s highest hill, the mighty Cheviot. This delightful river cuts a deep, narrow valley through the surrounding hills as it meanders towards the flatter ground on the eastern edge of the National Park. On this walk you will visit four of the six highest tops in the Cheviot Hills, Cushat Law, Bloodybush Edge, Comb Fell and the majestic Hedgehope Hill, whilst passing over some of the wildest country the Cheviot Hills has to offer. Your views will be extensive, your sense of isolation extreme and, if all of this is insufficient to meet your wayfaring needs, you will also climb high above three Cheviot valleys, skirt two major forests and cross mile after mile of vast open country. So pull on your gaiters, take a couple of deep breaths and prepare yourself for a heart pumping day in the hills. 1. Hartside Farm lies three miles from Ingram in the Breamish Valley and is the last point of public vehicular access along the single track road. There is roadside parking immediately before the farm buildings (NT 978162). The road continues as far as the small hamlet of Linhope, from where a track climbs to Linhope Spout, an impressive 60 foot waterfall. However, your route starts by turning left, immediately before the farm, following the signposted track to Alnhammoor. 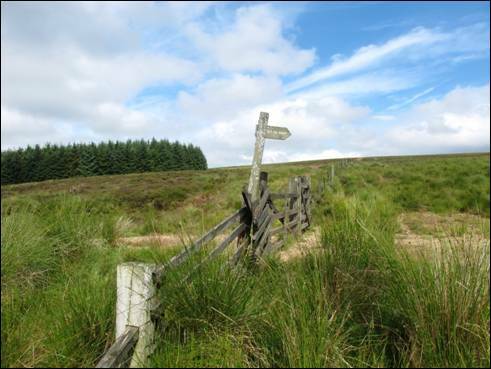 In just over half a mile, after crossing the River Breamish and just before Alnhammoor Farm, take the signposted footpath on your left. Once through the field turn right behind the farm and follow the faint green track travelling south west above the Shank Burn. After climbing the ladder stile and crossing the Rowhope Burn, the track heads, by various ways and means, towards the small saddle lying between Little Dod and the dominant bulk of Shill Moor. There are many hills in Northumberland bearing the name Dod, meaning `rounded`. The track, which is marked by the occasional fingerpost, is generally clear on the ground. As you gain further height the first hill of the walk, Cushat Law, looms large ahead with the more conical Hogdon Law to your left. Once on the saddle (GR NT950142) you join a gravel track which comes in from the south east, your left. At the arrowed fingerpost you need to turn right. You are now on the Salter`s Road, an ancient track which in times past was used to carry salt from the coastal saltpans over the border into Scotland. This was an illicit practice carried out in order to avoid the payment of taxes. 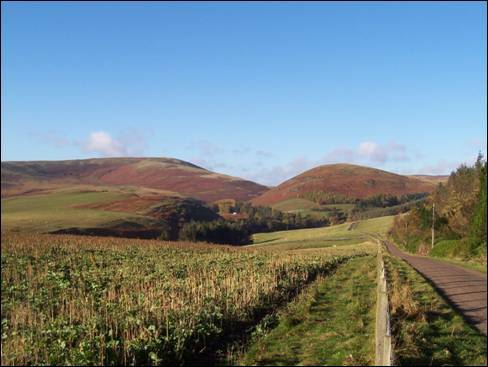 Originally called the Thieves Road, the track can be walked from the hamlet of Alnham on the south eastern edge of the Cheviot Hills, through the Upper Breamish Valley and eventually, after joining another ancient track Clennell Street, crossing the border at Hexpethgate just north of Windy Gyle. Continue easily in a north easterly direction until a fence and a gate is reached. Cross over (GR NT945145) and after about 150 metres watch out for the faint quad track to your left which begins to climb Bush Knowe on the lower slopes of Cushat Law. 2. When, in a short while, the track splits be sure to follow the right hand spur. Continue to follow the track upwards, pausing occasionally to admire the way you have come and the view across the Salter`s Road to the impressive sweep of Shill Moor. Once the track peters out, aim for the obvious green mossy area more or less straight ahead. Within less than 100 metres this comes to an abrupt end and a peat step will take you onto a pathless slope. Head straight ahead, keeping the cleugh of the Smalehope Burn firmly to your left. Within a very short time you will meet a quad track cutting across your way from right to left. Follow this track to the left and within minutes the shelter cairn of Cushat Law will come into view. 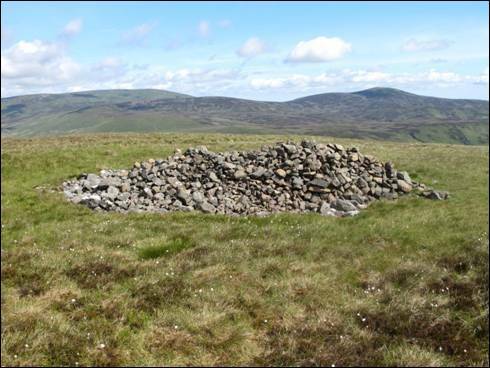 The top of the hill is actually located where the small stile (GR NT928137) crosses the fence just behind the cairn. There are extensive views in all directions, from the expanse of the Kidland Forest to the whaleback of the Cheviot, from the Northumberland coast to the Scottish border country and Sir Walter Scott`s beloved Eildon Hills. Cushat Law is the fifth highest hill in the range and is often referred to as the Monarch of Kidland. In 1532, 3,000 Scots, led by the Kers of Cessford, gathered on the slopes of this hill and 200 handpicked men rode down the Breamish Valley to “take up” the settlements of Ingram, Reaveley, Brandon and Fawdon. Another band of 200 men made their way down the Aln and harried the settlements of Great Ryle and Prendwick. These days the summit is rather more peaceful. 3. Time to press on in a north westerly direction following the fence off Cushat Law down to the wet col where the Ainsey Burn begins its journey. Keeping alongside the fence, with the forest away to your left, you will need to twist and turn your way across the saturated watershed before a gradually easing climb brings you to the top of Bloodybush Edge (GR NT902143), the sixth highest of the Cheviot Hills. 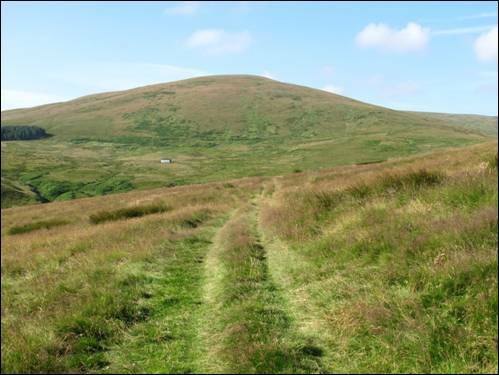 In July 1893 this hill was hit by a thunderstorm so savage that it literally scooped out many acres of peat sending an enormous volume of black peaty water into the River Breamish, the River Alwin and the Usway Burn, washing away everything in its path. The summit is marked with a triangulation pillar. Your route now heads downhill following the fence on the northern side of Bloodybush Edge. The initially steep and sometimes slippery ground eases as you once again join the Salter`s Road as it emerges out of the forest (GR NT904157), at the watershed between Bloodybush Edge and Lint Lands, before falling away to the Upper Breamish Valley. This too is your direction of travel through what once was fairly boggy ground but is now covered by the thin and relatively dry line of a helpful gravel track which eventually will aim you towards the top of Nagshead Knowe. Once there descend to the ford of the Ainsey Burn and cross the bridge over the River Breamish. Here the river, which rises on the slopes of Scotsman`s Knowe high on the southern side of the Cheviot, squeezes through the steep sided hills as it scurries south eastwards past the remote farms of High and Low Bleakhope before turning a full 90° around the flanks of the impressive looking Shill Moor. Head downstream for approximately 200 metres before taking the bridleway on your left (GR NT921162), climbing sharply towards, but not to the summit of High Cantle. Once the ridge (GR NT926164) is reached your route goes left over rough ground following the fence, first to Shielcleugh Edge and then to the rocky Coldlaw Cairn (GR NT913180). This must be one of the most isolated spots in the whole of the Cheviot Hills. Below you lies the embryonic River Breamish whilst to the north the Cheviot dominates the skyline. 4. From Coldlaw Cairn you continue to follow the fence across the barely noticeable top of Comb Fell, the area`s third highest hill, before descending gently to a damp col. From here the solid climb to the summit of Hedgehope Hill brings you briefly to drier ground and, at 714 metres, the highest point of the day. As you take a breather beside the large summit cairn (GR NT943198) the views eastwards to the cold North Sea are particularly satisfying. Now cross the fence you have been tracking since just after High Cantle, at the single step stile, and follow the fence which heads off the summit in a south easterly direction. 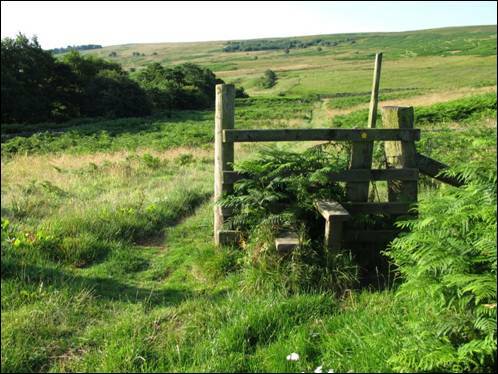 After a while the path splits into two so you must ensure that you follow the right hand spur heading away from the fence towards the Linhope Burn far below. On eventually reaching a gravel track which runs alongside the burn, turn left, cross over the gated bridge (GR NT956171) and head up the short hill via the track. With Ritto Hill almost ahead of you follow the track downhill alongside a delightful plantation which drops down to the hidden Linhope Burn way below. Before long the track joins the private tarmac road at the peaceful hamlet of Linhope. Follow the road over the bridge across the Linhope Burn which cascades away to your right for a further 100 metres before finally merging into the River Breamish. Two short climbs along the road and you are in sight of Hartside Farm where a gentle downhill stretch returns you to your car. Mainly mixed fell of grass & heather, boggy & rough in places, steep ascent & descents, some gravel track & tarmac.